Sarcoma is one of the rarer forms of skin cancer that typically occurs in the connective tissues of the body. It’s also referred to as soft-tissue sarcoma. The testing, diagnoses, and staging of sarcoma cases is highly individualized to each patient. SCARS offers Orange County area residents customized sarcoma cancer treatment based on your case. Treatment may include surgery, radiation, or chemo. As with most skin cancers, early detection is important and can make a difference in the efficacy of your treatment. If you have pain, swelling, or lesions or if members of your family have been diagnosed with sarcoma, contact us to begin appropriate diagnosis and treatment. 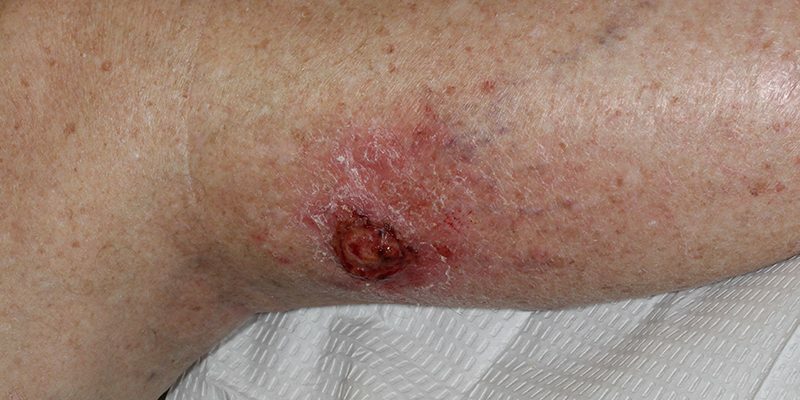 The most common sarcoma of the skin is a pleomorphic sarcoma. It can also be called an undifferentiated pleomorphic sarcoma. The most common skin sarcoma is a malignant fibrous histiocytoma (MFH). These lesions can be confused with an atypical fibroxanthoma (AFX). AFX tends to appear as a dermal nodule without significant skin change on the surface, while sarcoma or MFH presents as an ulcerating nodule due to its aggressive growth. Skin sarcomas like all sarcomas are highly aggressive with ability to spread through angioinvasion, perineural invasion, and lymphatic spread. These lesions also have a tendency of exhibiting intradermal skip areas with dermal metastases. Treatment of skin sarcomas involve wide local resection, followed by radiation. Lymph node evaluation with either sentinel lymph node biopsies or lymphadenectomies can aid in staging the cancer.